Two weeks ago, whilst searching for a gluten free cheesecake recipe, I came across this little beauty on a great blog, The Gluten Free Scallywag. Now, being immensely fond of the word scallywag, it just had to be tried. Too much citrus is never enough for this cheergerm, so I added a tad more lemon juice than the recipe said. As a result, when the springform pan was undone, it was a bit too melty to serve. To the freezer I cried! After an hour of nervous nail biting (or completely forgetting it was there due to the odd champers or two) we discovered, a frozen cheesecake! A delicious accident. Kid 1 and The Yak loved it so much, I churned out another one for a Christmas get together the other night. Frozen cheesecake, that’s how we roll now baby. Before serving, I tumbled some blueberries atop in a very Nigella type manner. Grated the zest of one lemon and lime, halved it, added half to the base mixture and half to the cheese mixture. Not having baked The Gluten Free Scallywags GF graham crackers, I used half GF arrowroot and half GF rice coconut biscuits. I added 2 tablespoons of lime juice in the cheese mixture and sneaked in 1/4 teaspoon of vanilla paste as well. Big cheesecake tip,always bring the cheese to room temperature before mixing. 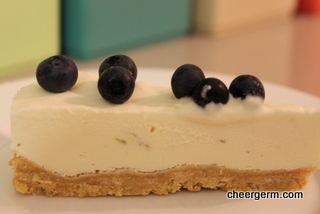 I put the cheesecake in the fridge overnight then popped it in the freezer a few hours befor serving. Make sure you pull it out for about 15 minutes or so to ensure you can cut it. Go here for the fantastic recipe! 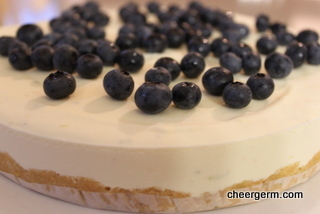 This entry was posted in Christmas, Gluten free baking and desserts and tagged cheesecake, cheesecake recipe, Christmas, coeliac, frozen cheesecake, gluten free, lemon, lime, Recipe. Bookmark the permalink.